Stronger than wood decking and less expensive. Decking can be made to fit any existing system. 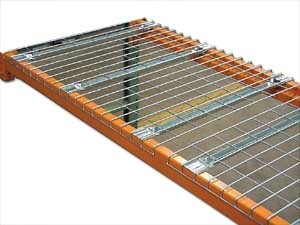 Wire mesh deck is constructed of 4 ga. wire mesh with 13 ga. support channels for a universal fit on step or box style beams. Capacities are based on evenly distributed loads. Some of these are custom size! and may require a minimum order. FOB IL, CA, or TX. WE CAN FABRICATE ANY CUSTOM SIZE! Product No. Size D x W Cap. (lbs.) Wt. (lbs.) Price Ea.